Oh, how magnificent Paris is when the sun is out! The blue skies beckon, and there’s a magnificent joie de vivre in the air. Everyone’s clamoring to get out, and you won’t be disappointed with the assiette full of outdoor activities in Paris to choose from. So, put on your walking shoes, because here are INSPIRELLE’s top picks to inspire you to head outside and get moving. Forget the bus, metro, and taxis! There are other more interesting ways to explore Paris at a leisurely pace if you want to take the time to really see the many sights the city has to offer. 1. BIKE: Renting a bicycle is as easy as 1-2-3 in any neighborhood through Vélib Metropole. There’s no booking. Just turn up with a credit card at any Vélib Metropole docking station and follow the on-screen instructions to select a bike. 30% of the fleet are electric, to help you navigate Parisian hills with ease. Fees start at a reasonable 1€ for 30 minutes! Bike through one of the scenic parks or along the banks of the Seine. When you’re done, just return your bike at any docking station. Tip: Safety helmets are not mandatory in Paris, but we strongly recommend you bring your own bike helmets, especially for little tykes! Don’t know where to go? Join a guided bike tour of Paris, Versailles or Monet’s Garden in Giverny with the friendly folks at Fat Tire Bike Tours. 2. SEGWAY: If you’re looking for more speed, you’ll love zipping through the French capital on a Segway, a motorized chariot you navigate along the sidewalks with the help of an experienced guide. Fat Tire Tours begins each tour with a very thorough orientation of the Segway. For safety reasons, no little ones allowed and adults must accompany older kids 12 to 17 years old. It’s got to be the coolest way to see Paris! 3. HOT AIR BALLOON: Yep! You can soar high over Paris in a hot-air balloon. Le Ballon de Paris has a montgolfière waiting for you in the Park André Citroen. Blast straight up 150 meters for an eye-popping aerial view of the French capital. But, don’t forget to check the weather forecast first! 4. TRAIN or TRAM: For some retro fun, take le Petit Train which weaves through the picturesque streets of the charming Montmartre neighborhood, once home to the likes of Picasso and Modigliani. Or, jump onto a funicular (tram) with a breathtaking view as it transports you up the hill to the foot of the Basilica of Sacre Coeur in less than 2 minutes. Then, buy a yummy crêpe and sit on the steps of the Sacre Coeur. And, don’t forget to have your caricature done by one of the many artists set up in the café-lined square at Place du Tertre. 5. BOAT: Hop onto one of the many boats that cruise along the Seine and sit back to absorb the beauty of the City of Lights. The most well-known boat companies include the Bateaux Mouches, Bateaux Parisiens, and Vedettes de Paris, which offer commentary and dining options; and the Vedettes de Pont Neuf if you just want the commentary. For a no-frills ride, opt for the Batobus river shuttle. Keep your eyes open in the direction of the Eiffel Tower for a brilliant light show at the top of every hour every night. A sheer, dazzling site! No matter how long you’ve lived in Paris, a boat cruise never loses its awe factor. Lucky for us, Paris has no shortage of green pockets of nature where we can enjoy a picnic, take a leisurely stroll or an energetic run, ride a pony, row a boat or go cycling. Here are just a few of our favorite spots. 6. Row, row, row a boat gently down the stream in one of the four lakes situated in the expansive Bois de Vincennes, which was once a royal park and hunting domain, in the east end of Paris. When you dock, there are lots of activities to keep you busy all day in the biggest park in Paris: from the medieval Chateau de Vincennes, to the adjacent Parc Floral botanical garden (which has a large recreational area for kids and outdoor concerts in the summer) to horseback riding, and even a Zoo! 7. Pilot a pond yacht in one of the ponds found in two of Paris’ most beautiful vast gardens, the Jardin de Luxembourg or Jardin des Tuileries. 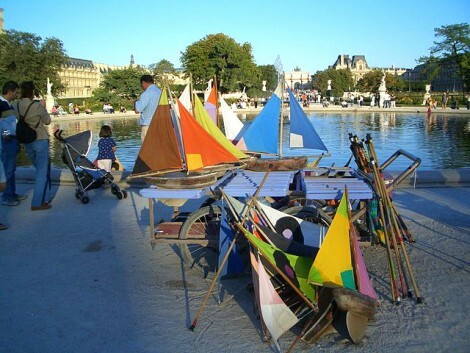 Like Parisians have been doing for over a century, you can rent a colorful wooden voilier (pond yacht) which you navigate with a rod and race against others. If pond yachting becomes a passion, you can even buy your own hand-crafted voilier! 8. Build your own kite at the Maison du Cerf-Volant, then pack it along with a picnic, and head over to the magical Parc des Buttes-Chaumont in the 19th. Your fresh baguette, cheese, and charcuterie will taste even more delicious in the open air, and no one will stop you from popping the cork in a public park. This gem of a respite from the city features a temple, a man-made lake and waterfall in natural, hilly surroundings. When night falls, head over to the Rosa Bonheur guinguette, an open-air dance hall, for a relaxed drink and dancing with till midnight. 9. Run or cycle around the second largest woods of Paris, the Bois de Boulogne. Bordering Paris’ 16th arrondissement and neighboring Neuilly-sur-Seine, it’s a hub of outdoor activities, especially on weekends, when some roads are closed to cars. You’ll find several lakes, a waterfall, the Château de Bagatelle and its gardens, sports grounds, two horse racing courses, and expanses of grass where you can spread out your picnic blanket. One of our favorite spots for a Sunday brunch within the park grounds is the Chalet des Iles, which sits on a pretty little island accessible only by rowboat or ferry. 10. Also located in the Bois de Boulogne is one of our favorite family hangouts: the Jardin d’Acclimatation. This quintessential French amusement park has fantasy carousels, a lake, a mini zoo, interactive playgrounds, “les guignols” puppet theatre, pony/donkey/camel rides, giant trampolines, restaurants, and more! When it’s hot outside, sprinklers and misters around the park will cool you down. Its Maison des Ateliers offers a variety of workshops throughout the year for children and adults. Located just minutes from the Arc de Triomphe, it’s sure to become one of your family’s favorite Parisian destinations at any time of year. 11. Fishing in the Seine may not have crossed your mind, but in recent years it has become kind of a thing! Urban anglers can find perch, pike, and black bass in the river, along the canals, and in the lakes of the big woods of Boulogne and Vincennes. But, whether you’re just passing through for a day, or you want to make it a regular outing, you’ll need to get a permit at Cartedepeche.fr. New to the sport? Take a workshop at La Maison de la Pêche et de la Nature! 12. Whack a golf ball or putt to your heart’s delight at the family-oriented multisport park, Haras de Jardy, just west of Paris. See if your child is the next Tiger Woods and sign him or her up for group lessons from the age of 4 up. You can rent kiddy clubs to try first. Teenagers who can hit a ball can play on the short-range 9-hole course. And if golf is not your swing thing, join the tennis or horse-riding club! There’s a friendly café in the clubhouse for snacks between sports. The 75-hectare, wooded, public park is open to everyone. 13. Join the midnight madness on wheels as hundreds of rollerbladers take to the streets of Paris every Friday evening for a magical, late-night rollerblade course around Paris. Sign up for free online with the Pari-Roller Association, then show up with your blades at 9:30 pm for a 10 pm start in front of Tour Montparnasse in the 14th. Anyone who can balance, brake and move on blades can join the 2-1/2 hour course, but the 27km trail is not for the weak-legged. If you subscribe to the association, you’ll even get insured in case of an accident. 14. One man’s junk is another man’s treasure. Garage sales are forbidden in Paris; but watch out for the community weekend “braderie” or “vide-grenier” (empty the attic) authorized by the local Mairie, or city hall. Take advantage of spring cleaning as families empty their closets and toy boxes to fill up street stands. Young entrepreneurs can make a buck putting up their old toys, books and DVD’s for sale. Check out this website for dates of these sales throughout Parisian neighborhoods and its surrounding suburbs. 15. Scavenge the city’s largest flea market, “Marché aux Puces Saint Ouen”, near Porte de Clignancourt, to find a curated collection of everything from art to vintage clothing, antique toys, old buttons and books to period furniture – and even full-sized antique staircases! Collectors and buyers from all over the world converge here to go treasure hunting among the 15 markets which make up “les Puces”. It’s the largest of its kind in the world, so, check out the official website to zero in on the marchés you may be interested in before going. We love starting at Paul Bert Serpette, which is considered the “flagship” market within the market. For lunch, try Chez Louisette, an original guinguette serving traditional French food as local singers serenade with Edith Piaf songs, or the trendy Philippe Starck-designed Ma Cocotte. Whether you’re passing through or you’ve lived in Paris for years, you’ll find there is always more to see and learn about the varied neighborhoods and history of this amazing city. Why not break away from the usual, and let someone show you a part of the city you may not have explored on your own? 16. Delve into the Secrets of Paris on a private tour with Heather Stimler-Hall, author of the Naughty Paris guidebooks, or one of her team of experienced guides, who are travel writers and journalists. They’ll tailor a tour to take you through some of the most charming, hidden corners of the city, and shed new light on the most famous, yet often misunderstood, monuments of Paris. 17. Want to find out where luminaries like Josephine Baker, Duke Ellington and Miles Davis hung out during their heydays in Paris? Explore the rich cultural heritage of Black Paris through Walk The Spirit Tours. They offer a full range of Black Paris & Beyond vacation and travel services that help share their passion for Black heritage and give travelers an authentic taste of traditional France and Europe. Read about founder Julie Browne HERE. 18. Learn the stories behind famous Paris landmarks and neighborhoods on a Story of a City tour. Your guide, Laura Moore, is a professional storyteller who loves history and the stories that make Paris one of the most fascinating cities in the world. She’s roamed every inch of the city to find the stories that are worth telling, and she’s ready to share them with you. Did We Miss Your Favorite Activity? Do you have a favorite springtime activity in Paris that you’d like to share with us? 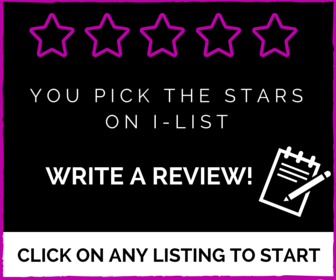 Let us know in the comments box below!